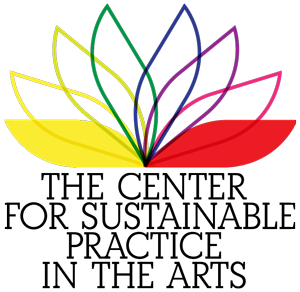 Arts Territory Exchange Residency in Sustainable Practice. The ARTS TERRITORY EXCHANGE is an organisation which facilitates creative exchange across borders and works with artists in remote locations and those whose work explores ideas of place, territory and environment. ATE’s work involves the pairing up of Artist’s across the world in creative long distance correspondences. The first ATE Residency in Sustainable Practice took place on Art Aia’s Eco farm in Friulia, Italy this September and ran in conjunction with the Pordenone Litterary festival. The CSPA advised on the project and Meghan Moe Beiticks was on the selection panel alongside Veronica Sekules, art critic and curator at GroundWork Gallery, UK. Kelly Leonard in Australia and Beatrice Lopez in Norway had been corresponding digitally and by post for a year before they were selected by the panel and had developed an intriguing body of weaving and text based works forging a dialogue between their respective locations. The idea behind the residency was for participants of the ATE to be able to meet face to face and spend a week intensively developing the work they had already begun, with specific focus on ideas of sustainability in its material and conceptual forms. 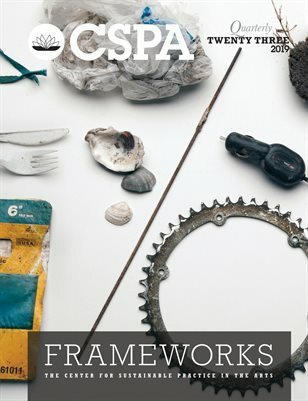 The artists were provided with a series of contextual writings on ecology and arts practice and were encouraged to engage with some of the CSPA’s back editions. Art Aia’s Eco farm in Fruilia provided an interesting backdrop through which to engage with ideas of sustainability extending beyond the materiality of the art world, the artists were able to visit vineyards and factories and discuss the crossovers of culture and sustainable agriculture with their host Giovanni Morassutti. Giovanni says his Art Aia residency space has its interests in ‘Creating the kind of connections between people that lead to collective civic action, political expression, community dialogue, shared cultural experiences’. The artists already had shared interests in textiles, weaving, and installation as performative action in outdoor settings, performances which have political dimensions beyond the traditional uses of their chosen materials. Kelly installs woven works in the landscape around her home town of Mudgee, Australia – a location threatened by the open-cast coal mining. Her works are conceptual and ephemeral referencing 1970’s activist stitchers such Kate Walker and more contemporary iterations such as ‘Yarn bombing’, subverting the very domestic history of women’s tapestry weaving and stitching. They are guerrilla actions with serious messages about climate change and the destruction of habitats, stitched messages such a ‘resist’ and ‘Regent Honey Eater‘ – yet the works are sensitive to the local environment – photographed and then removed. This respect for the environment and the responsibilities of the artists within it was shared with co-collaborator Beatrice Lopez with her own practice, placing temporary compositions within the Norwegian landscape. Beatrice and Kelly had already developed a number of ideas during their ‘digital’ and postal collaborations and began to adapt them in relation to the Italian landscape and residency space. Kelly Leonard says ‘Our year of working together in the virtual space meant we had a foundation to draw from when we met, we had a type of creative short hand already established’. Meeting in person the artists noted their physical differences in terms of, weight, body shape and age. ‘Sketch for a performance for two people’ Image Courtesy of the artists. In the documentation of the performance works undertaken at the residency their height difference is particularly apparent, adding an interesting extra dimension to their performative works. Installation in Art Aia Project space. Image courtesy of the artists. Beatrice and Kelly share common interests in the politics of place and post colonial narratives, both researching, and feeling affinity with, the indigenous cultures of their homelands, Kelly, as an Australian of European heritage, acknowledging the cultural authority of the Wiradjuri people as the traditional owners of the land in which she makes her work. Throughout their time working together the artists have used the phrase ‘Connected by a Thread’ as a motto through which to explore environmental causality and potential for spiritual affinity. In researching the cultures of Huichol Indians of South America, Beatrice had previously begun to work with ideas of ‘offerings’ made to the elements of the earth as a way of re dressing a balance tipped over by a culture’s obsession with production at the expense of the environment. 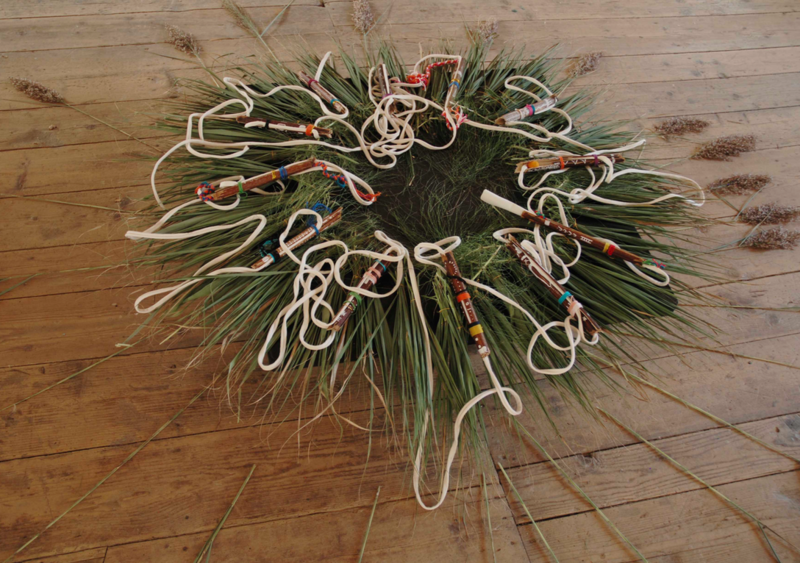 The Motif of the ‘offering’ is one which also comes through strongly in their collaborative work and is felt on a number of levels beyond symbolic reparations to nature. Their works are offerings to an audience, documents of performative actions, and act as residual templates of the artists physical experiences with the natural elements they work with. Regarding their work ‘Prayer Wheel’, one can imagine the performative and repetitive actions which led to its creation; the collecting of local grasses, the tying of grass bundles, positioning grass and read heads in a circle, winding sticks with colourful yarn… each wrapped stick containing a written instruction for an immersive call to action; referencing the prayers contained in a traditional Buddhist Prayer Wheel and offering potential for audience engagement. ‘Prayer Wheel’ Image courtesy of the artists. Art Aia Project space. The ideas of repetitive and ritualistic practices are followed through in the other works made on the residency, In ‘Interconnected Walk’ the two artists walked over a three day period, in two large intersecting circles similar to a lemniscate symbol. (See a short Video documenting part of the performance Here). The work makes obvious reference to walking artists such as Richard Long and Hamish Fulton but, is conceived as a walking performance for two. Watching the artists courteously side step each other as they cross paths at certain intersections is touching, saying perhaps more about their growing relationship with each other than the land scape they are marking with their repetitive footsteps. 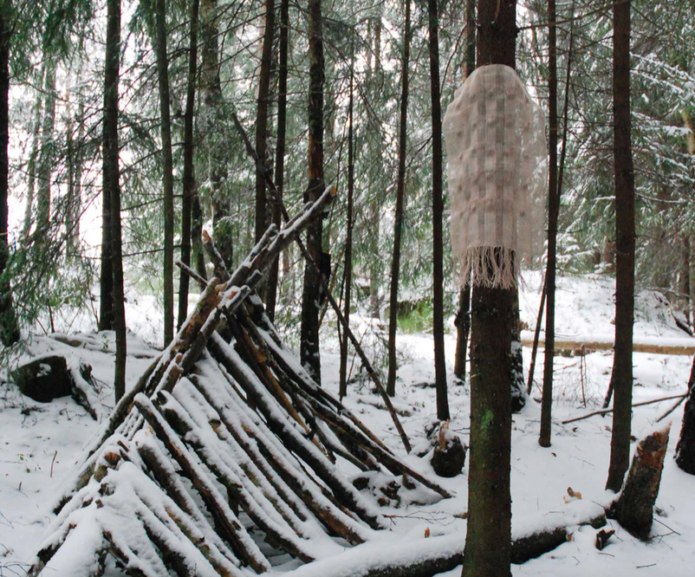 In ‘Soft Touch’, Soft white Icelandic wool brought to the residency by Beatrice, rests on top of local detritus, broken leaves, feathers and sticks. 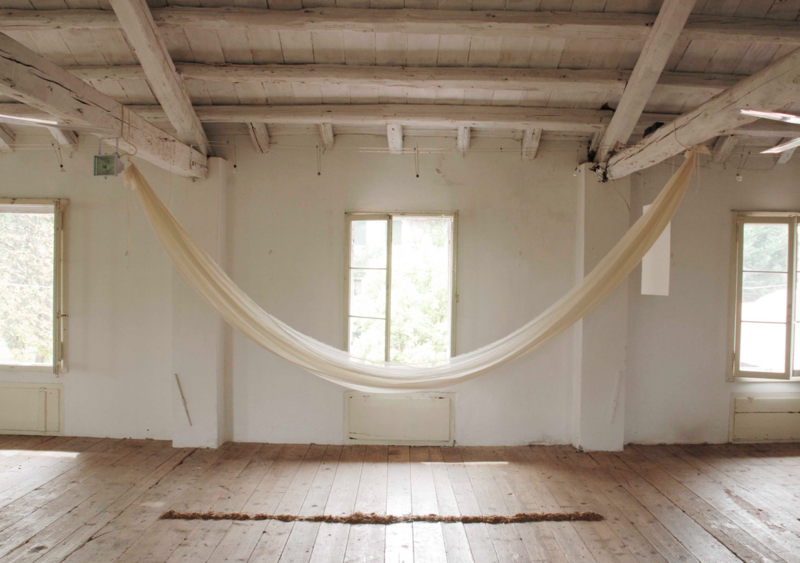 The piece evokes both a nest and alter – the clean pristine wool, an offering to temped hands, to touch and lift its threads. Another work ‘Water talks’ was made by recording ambient sound of water near to their residency accommodation, a land of damp earth and agricultural irrigation ditches. Overlaying the sound of water, the two artists recite a poem by Norwegian Poet Lars Saabye Christensen, Kelly in English and Beatrice in Norwegian. 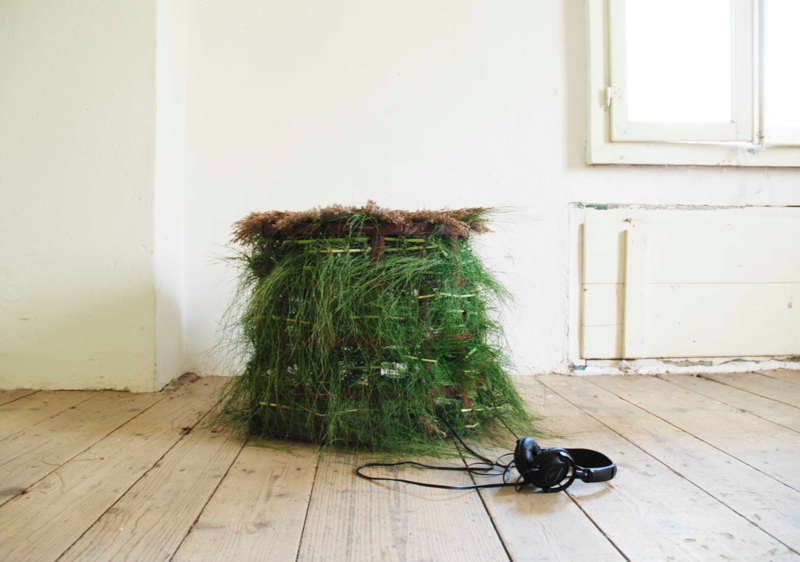 The sound piece ‘Water Talks’ housed in a metal frame structure interwoven with Puzzlegrass and Reed heads. A further work ‘South North’, makes connections between the three countries, Norway, Australia and Italy; a silhouette of Kelly traced in pebbles is connected by a thread which runs across an antique map of Norway, out over the lintel of the window, into the Italian countryside… As well as connection between the three locations, disjunctures were also keenly felt, departing Australia at a time of drought, Kelly was shocked by how verdant Northern Italy was, saying, ‘I found the area of Italy to be too green, too rich, too comfortable…’. 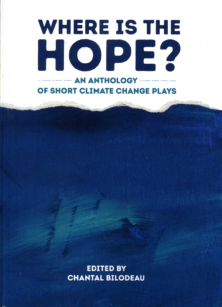 The impact of climate change is felt very differently in Europe, not as urgently perhaps, although a short train journey from Art Aia’s residency space, sea levels rise around a sinking Venice. I first learnt to weave as a teenager from a German Master Weaver, Marcella Hempel, in Australia. My art practice has been re-activated since moving back to my home-town two years ago; moving from a traditional craft based medium to one that is highly conceptual, collaborative and moves across art forms responding to the environment. My work is very much informed by environmental philosophy which provides a context for both making and showing the work. I weave on a European floor-loom what I call props for the environment which are placed in site-specific locations around Mudgee, photographed and then removed. The locations are chosen because they are under stress from the impact of the open-cut coal mines operated by the big coal mining companies. The images are exhibited on-line and one of my goals is to develop some alternative broadcasting methods to reach a wider audience in the near future. The work I make is pretty much process driven and I derive a lot of satisfaction from thinking of the environment as a collaborator and audience. I make work in Wiradjuri Country whose sovereignty was never ceded, I walk on traditional land. I try to consider all aspects of a landscape by: how it smells, tastes, feels, sounds and the multiple narratives embedded into it. The landscape is never passive, always watching me make work. It is also a collaborator, helping me to shape the work. Beatrice is an artist that works in different mediums such as painting, installation and sound. Gaining a BA from Nuova Accademia di Belle Arti in Milan as well as an exchange from the Pratt Institute in New York. She has had a solo exhibition entitled `Ritual Lines` at Art Licks festival and taken part in various group exhibitions through institutions such as White Space gallery, MAMU galleria and most recently at Galleri Vanntårnet. Through her abstract paintings in ink and soft pastel, fleeting textures appear reminiscent of inner visions and organic forms. Her multimedia works are placed in nature, using thread and organic material to create curious compositions. Her continuous interest in nature and topographies has led her to take part in the Arts Territory Exchange, an ongoing collaborative correspondence project based on nature, ecology and topographies. Exchanging ideas by post with the artist Kelly Leonard based in Australia. They met for a one week residency this fall made possible by CSPA and ATE. Beatrice participated at Performance Art Oslo event `Contemplating landscape through art` this year at Steilene in Norway. Beatrice was born in 1986 and is currently based in Oslo. 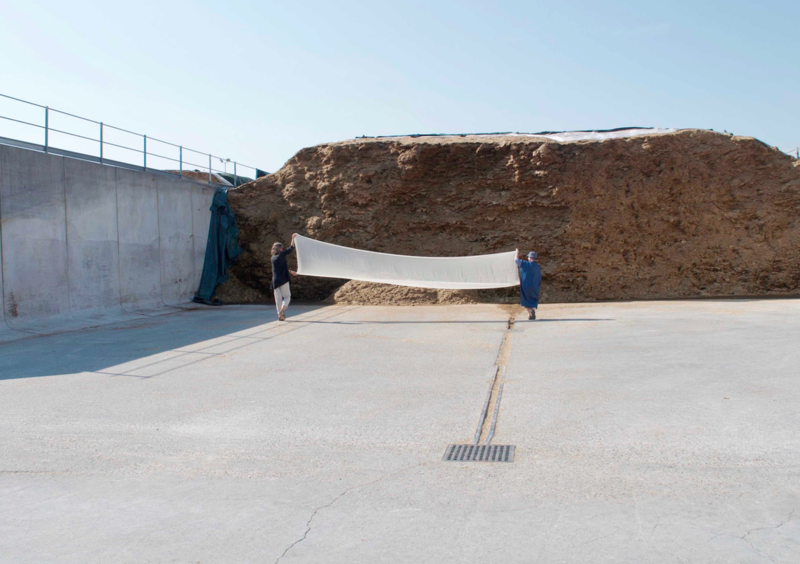 Holding the ATE residency in Sustainable Practice at Art Aia In Pordenone was an attempt to forge connections between artists, farmers, eco entrepreneurs and members of the local rural community. A weaving together of conceptual and material iterations of ‘sustainability’, interests which ATE plans on developing in various forms and in different locations in future years. Thankyou to Beatrice Lopez and Kelly Leonard for their participation in this residency.